A campaign which aims to encourage EU nationals to stay and continue to live and work in Scotland despite ongoing uncertainty around Brexit took place in Edinburgh today. 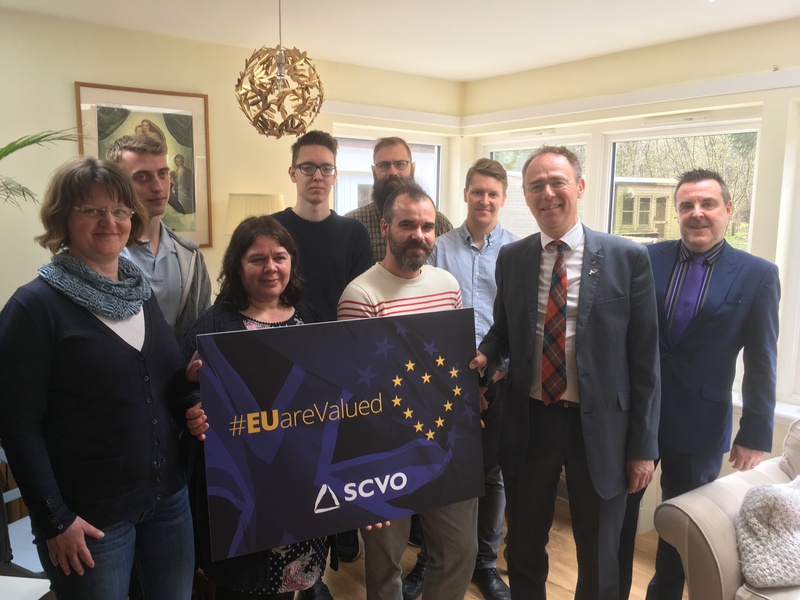 Created by the Scottish Council for Voluntary Organisations (SCVO), the #EUareValued campaign was launched at Camphill Scotland’s Tiphereth Community in Colinton by Minister for International Development & Europe Alasdair Allan. According to the Office for National Statistics, 117,000 EU nationals left the UK in 2016 – the year of the referendum – a 36% increase on 2015. Despite not legally being required to leave Scotland, many EU nationals no longer feel welcome or confident enough to stay in Scotland long term. This is partly due to the outcome of the referendum, the rhetoric used throughout the campaign and the media coverage of it. Worryingly, between May and September 2017 Crimestoppers experienced an 88% increase in all hate crime contacts and a 40% increase on contacts regarding racism, compared to the previous five month period. Camphill Scotland communities support people with learning disabilities and other support needs, and as over 40% of the organisation’s staff are from other EU countries, there are concerns that the outcome of the EU referendum, any resulting immigration policy changes and the surrounding negative rhetoric will mean that many of these people will be or feel unable to continue living and working here in Scotland. “The role that EU workers play in Scotland is not only of huge benefit to our country, both culturally and economically, it is vital to delivering high quality public services to the people of Scotland. “Camphill Scotland is just one of many organisations I have met with that have been clear that the ability to recruit from an EU-wide pool is essential. The simplest solution is for the UK to remain within the European Single Market and Customs Union, enabling people to work and travel freely across Europe. Dr Neil Henery, Director of Camphill Scotland, said: “We are deeply concerned about the potential impact of Brexit upon Camphill communities in Scotland. Camphill was founded in Aberdeen by Austrian refugees and remains a profoundly European movement. Our recent survey showed that no less than 40% of our total workforce are from other parts of the EU. A ‘toolkit’ of helpful information and resources is available on the SCVO website so that all of its’ 1,800 member organisations – as well as any other charities, social enterprises or voluntary organisations across the country – can have the support required to show their EU colleagues they are valued and to support them over the coming months.